A new community plan for the Midway-Pacific Highway area would greenlight lots of dense housing near jobs and transit. But the plan was delayed in May because of Councilwoman Lorie Zapf’s concerns about how it handles traffic in the area. A new community plan for the Midway-Pacific Highway area is heading for City Council approval. Unlike recent plans for other neighborhoods that only ended up making modest changes, this one really would greenlight lots of dense housing near jobs and transit. The plan was delayed in May because of Councilwoman Lorie Zapf’s concerns about how it handles traffic in the area. One fellow councilman thinks the delay was really due to election-year politics. The Midway-Pacific Highway plan, which has been winding its way through the city’s bureaucracy since 2010, would more than double the homes that could be built in the areas around Midway Drive, Sports Arena and the Pacific Highway Corridor north of Little Italy, while making room for 4,000 more jobs. By comparison, new community plans in Uptown, North Park, San Ysidro and Golden Hill combined to increase housing density by just 4 percent. The city has pegged its future growth to dense, transit-focused development – especially through a Climate Action Plan that promises half of residents who live in urban areas will commute without a car by 2035. Ninety-nine percent of the growth envisioned in the Midway-Pacific Highway district is in so-called transit priority areas, or areas within a half-mile of high-frequency transit service. But the plan’s passage hit a snag. In May, city planners brought it to the City Council’s committee on housing and development for approval, a last step before taking it to the full Council. Planners at that meeting said they’d hoped it could be approved by the full City Council a month ago, on June 26. Zapf, who represents the district, raised issues at that meeting – mostly based on the amount of traffic the plan would add to the area, and the extent to which she thought city planners hadn’t done enough to combat it. She proposed a handful of changes aimed at alleviating some of the traffic from all the new growth. A new timeline would put the measure back to the City Council as early as September after addressing those issues. But Councilman Scott Sherman suggested at that May meeting that the delay really owed itself to election-year politics. Zapf is running for re-election in District 2 against Democratic challenger Jen Campbell. Zapf and Sherman are both Republicans. Donna Cleary, a Zapf spokeswoman, said Sherman’s comment didn’t make sense, since the plan is now scheduled to go to Council on Sept. 17, right in the heat of campaign season. 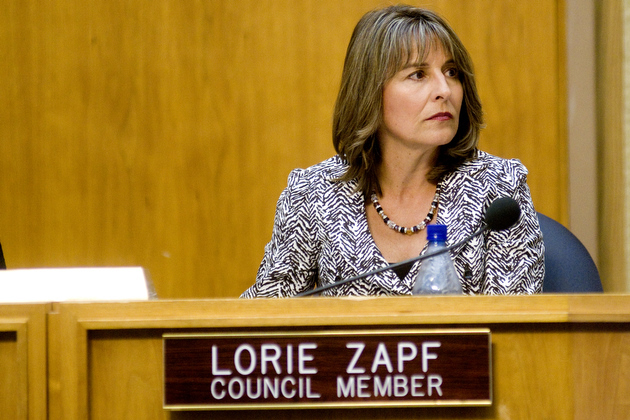 “I don’t understand that at all, both Councilmembers [Georgette] Gomez and Zapf raised substantial concerns about the plan and asked staff to address them,” she said. It wouldn’t be the first time a proposal to increase development in that district got caught up in a Zapf re-election bid. Four years ago, city planners proposed building dense housing around two new trolley stations on the Morena Boulevard corridor, including raising height limits. Zapf’s challenger at the time jumped on the issue, stoking discontent at a boisterous town hall. Zapf wrote a memo telling city staff to abandon the idea. They did, and that proposal now focuses only on the trolley station on Tecolote Drive in Linda Vista. On the proposal in Midway and Pacific Highway, Zapf hasn’t taken issue with the new development, but said she couldn’t support a plan that doesn’t do more to counter its effects on traffic in the already-congested neighborhood. And she doesn’t understand the hurry. The Midway planning group last week unanimously approved four amendments to improve the plan’s traffic impacts spearheaded by Zapf’s office. Cathy Kenton, the planning group’s chair, said her group had previously pushed for more traffic improvements and was happy to see Zapf push for the same. She doesn’t expect the plan to become a campaign issue if it comes back in September. Campbell, Zapf’s opponent, said the city’s struggles updating community plans have left neighborhoods without needed infrastructure, and she’s glad the Midway community has a plan it’s excited about. First and foremost, Zapf’s changes would push city staff go to bat for a new freeway interchange that would connect I-5 to I-8 West, creating a new way to enter the community that bypasses Rosecrans Street and spreading that traffic out. That would require lobbying the San Diego Association of Governments and Caltrans to prioritize funding the project, since it isn’t currently slated for construction until 2050. She also wants the plan to encourage employers to create park-and-ride policies that take advantage of the Old Town trolley station nearby and for the city to launch a feasibility study for a connector ramp from Barnett Avenue to I-5. Plus, she wants the city to pursue an infrastructure financing district – an arrangement that lets specific areas borrow against future tax revenue growth so they have enough money to build major infrastructure projects, instead of waiting for the money to come in over time. In an email, Zapf said she’s going to keep working on what she believes are the plan’s traffic shortcomings. “Reducing traffic and congestion is my main objective and that’s why I will continue to work closely with city planners on additional language and policy recommendations that will revitalize the community and address this important goal,” she wrote. Despite its current holding pattern, the plan represents much of what the city has promised as its new approach to growth and development. Roughly 75 percent of the community is covered by transit priority areas, the areas that are subject to the city’s goal to have half of residents commuting by walking, biking or taking transit by 2035. The plan would make way for 11,585 units, from the 1,982 that exist today. “Almost all of these (new) units will be located in transit priority areas,” said Vickie White, the city’s lead planner for the area, at the committee hearing. And unlike so many density increases the city has tried to push through, Midway’s new housing hasn’t been especially controversial, Kenton said. The opposition there has been has come from neighboring communities in Point Loma and Ocean Beach, she said. Along with all the new housing, the plan would also create four new village areas; one at Sports Arena, one by the old Post Office on Midway Drive, one near the Washington Street trolley station along Hancock Street and one around Kemper Street south of Midway Drive. Those villages would also create new roads, in hopes that they could divert traffic from the existing congested corridors. The city owns nearly 100 acres of land in the Sports Arena area. City planners are expected to write a more specific master plan to redevelop a new village area there, which would help clear up what the city plans to do with the Sports Arena itself. And the plan would approve a handful of fully protected bike lanes. The city has committed to building a network of protected bike lanes as part of its goal of encouraging people to commute without driving, but has little to show for the commitment so far. That’s in part because proposed bike lanes always seem to find local opposition, especially from business groups, and that’s the case here as well. Businesses on Hancock Street want the city to remove a protected bike lane, because it would reduce parking in the area. At the committee hearing, both Councilman David Alvarez and Councilwoman Georgette Gomez said they hoped city staff would protect the protected bike lanes. But updating the plan itself could be a precursor to another big move. The Planning Commission recommended approving the plan, but asked city staff to explore putting up a ballot measure to waive the city’s coastal height limit in some parts of the Midway area, to make it easier for developers to reach the development limits in the new plan. That would need to go to a citywide vote. Tinkering with the coastal height limit could be among the most politically volatile policies the city could pursue, depending on how it’s handled. Whatever form that proposal takes, it wouldn’t hit the ballot until 2020 at the earliest. Kenton said her preference would be to recognize that it never made sense to include the Midway district in Proposition D, the measure approved by voters in 1972 that limited the height of buildings west of I-5, north of downtown. “I personally would rather see a vote to carve out a specific area that includes the boundaries for the entire community,” she said.